In 1979, Kirk Gibson rejected a chance to play for the St. Louis Cardinals. That’s because he was committed to playing baseball, not football. On May 4, 1979, the St. Louis football Cardinals selected Gibson, a wide receiver at Michigan State, in the seventh round of the NFL draft. A year earlier, June 1978, Gibson had been chosen by the Tigers in the first round of baseball’s amateur draft and signed a $200,000 contract with Detroit. The outfielder spent the summer of 1978 playing for the Tigers’ Class A Lakeland (Fla.) team managed by Jim Leyland. 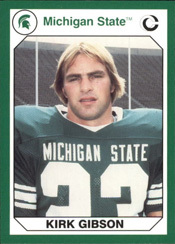 Then Gibson returned to Michigan State for his senior football season. Gibson established school single-season records for receptions (42) and receiving yards (806) in 1978. He finished his Michigan State football career with four-year totals of 112 receptions, 2,347 yards receiving and 24 touchdown catches, all school records. Gibson would have been “a certain first-round pick” in the 1979 NFL draft if he hadn’t already signed with the Tigers, United Press International reported. The Tigers assigned Gibson to start the 1979 baseball season with their Class AAA Evansville (Ind.) team, again managed by Leyland. Bing Devine, longtime general manager of the St. Louis baseball Cardinals, had become vice president for administration of the St. Louis football Cardinals just a week before the 1979 NFL draft. Cardinals football scouts approached Devine before selecting Gibson to find out what baseball teams had thought of Gibson. Devine offered a positive report. Gibson hadn’t played baseball at Michigan State until his junior year. He still was relatively inexperienced at the game and some thought Gibson might change his mind and return to football. “It was a calculated risk,” Devine said to the Associated Press of the football Cardinals’ decision to draft Gibson. “At this level of the draft, everyone’s a calculated risk. With his amount of football talent, I guess the people over in the drafting office figured he was worth taking a chance on. The Cardinals, though, gave Gibson plenty to think about. When reporter Jim Hawkins, a baseball correspondent for The Sporting News, visited Gibson at Evansville a month after the NFL draft, Gibson showed him four one-year contracts totaling $200,000 sent by the football Cardinals. The contracts, Hawkins reported, were for $35,000, $45,000, $55,000 and $65,000 for each of the next four NFL seasons. If Gibson wanted to quit baseball for football, he wouldn’t lose any contract money. In his first game for Evansville, against an Iowa Oaks club managed by Tony La Russa, Gibson had a two-run home run, a RBI-double, two walks and a sacrifice bunt. Gibson went on to bat .245 with 42 RBI in 89 games for Evansville. The Tigers promoted Gibson to the big leagues in September 1979. Gibson made his major-league debut on Sept. 8. Tigers manager Sparky Anderson sent the rookie to pinch-hit against Yankees closer Goose Gossage. The future Hall of Fame closer struck him out. Gibson never was tempted again to try football. He built a 17-year big-league playing career, helping the Tigers (1984) and Dodgers (1988) to World Series championships with memorable home runs (off Gossage in 1984 and off Dennis Eckersley in 1988) and earning the 1988 National League Most Valuable Player Award. As manager of the Diamondbacks, Gibson won the 2011 NL Manager of the Year Award. _ Halfback Ottis Anderson (7,999 yards rushing and 46 rushing touchdowns in eight years with St. Louis). _ Fullback Theotis Brown (10 rushing touchdowns in three years with St. Louis). _ Offensive guard Joe Bostic (122 games, 114 as a starter, in nine years with St. Louis). _ Wide receiver Roy Green (522 receptions, 8,496 yards receiving and 66 touchdown catches in 12 years with the Cardinals in St. Louis and Arizona).